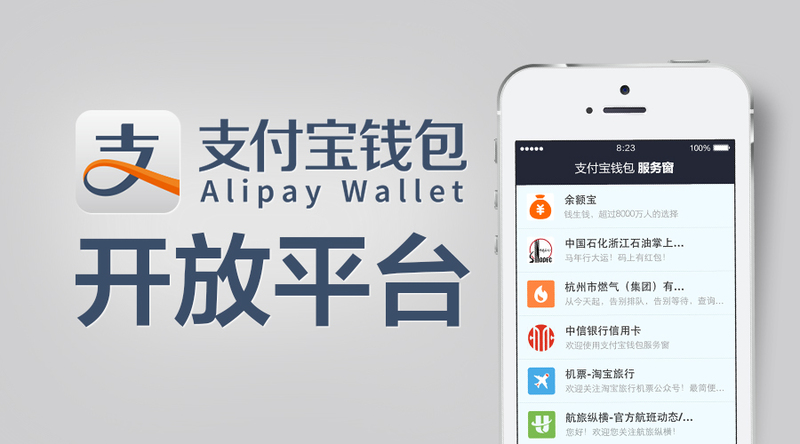 Alipay Wallet Launches an Open Platform Today,. Alipay Wallet, the app for mobile payments and other mobile services of Alipay, announced today an open platform that more than 60 APIs, programming interfaces and tools, have been available for third-party developers to access user data or create applications. The APIs enables third-party applications to interact with seven core features of Alipay Wallet, mobile payment, user account system, e-coupon, QR code, WiFi hotspot access, CRM service, and JASPI authentication. Since the past June when Alipay began testing those APIs, more than 1000 third parties have signed up that include Yihaodian (online retailer), Dianping (ratings & reviews service), New Hope Group (agricultural products company) and Guangzhou Women’s and Children’s Hospital. More than 100 million active users use Alipay Wallet for mobile payments, according to the company. The mobile payment capability has been available, apart from for making purchases online, for e-ticketing for public transport or taxi payments, and in pharmacies, footwear stores, and hospitals. Besides payments, Alipay Wallet has come up with a variety of mobile services, from customer loyalty programs to WiFi hotspot service.